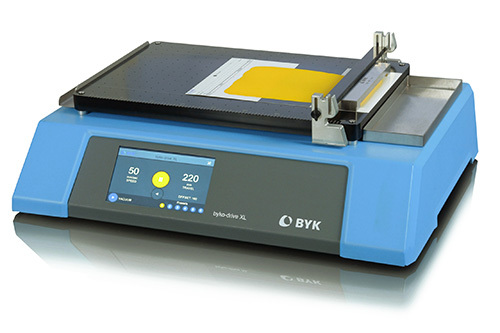 The byko-drive XL Automatic Film Applicator has the most flexible design to perform drawdowns of coatings and inks. The dry film appearance is impacted by drawdown speed and pressure on the applicator tool. A programmable speed control from 5 - 500 mm/sec. in 1 mm/sec. increments is standard. Interchangeable weights apply pressure across the entire length of the applicator for a consistent film thickness. The push bar is designed to accommodate a wide variation in wire-rod sizes, applicator bars, applicator frames, and film casting knives. The touchscreen display makes it easy to program the operating parameters: traverse speed, start position, and stroke length. There are six memory locations to save routine settings. The byko-drive XL has vacuum plate and glass plate platform versions. The vacuum plate and glass plates are user interchangeable for labs that need both platforms.